Aren't these flowers beautiful? I just love them! I've been making them for years for weddings and events, everything from arches, to walls and the backs of chairs. Since big flowers are back in vogue and are seen everywhere again, I decided to make this swag for a door prize for our Inking Idaho on the Road event last March. I purchased the vine and attached the flowers to it with wire. The small flowers are made with the Bouquet Bigz Die that is now retired from Stampin' Up!. Debbie Ware was the winner of the swag at the event. This is a pretty good picture for you to judge the size of the flowers. My downline really liked the flowers and so we decided that we would make them at our team meeting last month....and I was busy helping them and didn't get one single picture of the mass glue gun operation we had in my house! 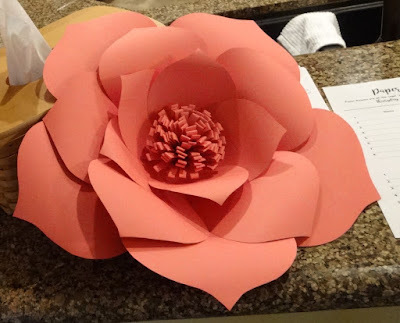 This is the flower we made in any color cardstock they wanted. The pattern for the flower can be found HERE. and just for all of you, I made a video on how to assemble them! thank you for sharing this tutorial. Did i count right that it takes eleven 12x12 sheets to make one flower? I am definitely going to try this. Oh my goodness, this is so impressive and I can't even imagine working on such a thing! You make EVERYTHING look easy, always, Becky (LOL)!!! I cannot wait to watch the video and thank you sincerely for sharing that, your photos and the story!!! Your swag is gorgeous! TFS! Beautiful! You made it look say! 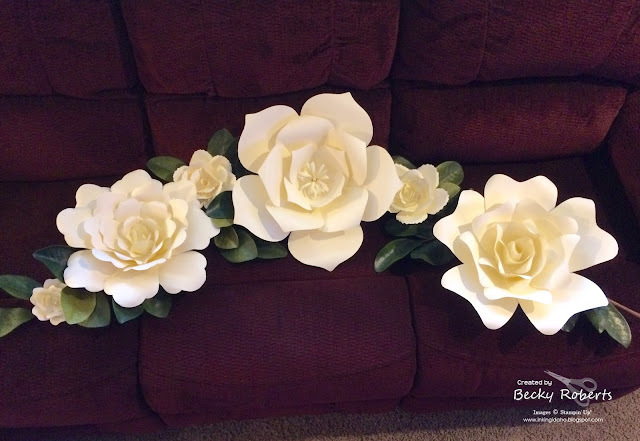 To my fellow paper crafter and UCB Momma Bear...You have made me smile from ear-to-ear with your big flower creations AND wonderful video tutorial WITH pattern ^_^ My son is getting married in early 2017 and these show-stopping flowers will be at a shower and the wedding for sure! Love YOU and your paper crafting talents! KT you make me smile! Becky you are so sweet to share how to make the beautiful giant flowers. The video explains the whole project perfectly. You went above and beyond by even including the pattern. Thank you with all my heart. Tzivia, I hung mine on a vine, you could do that or simply cut a giant leaf or two out of cardstock and glue behind it so it hangs out a bit. To hang them, cut a piece of heavy poster board into a circle. Punch 2 holes in it. Thread a wire or hook through the holes and hot glue the circle to the back. Now you have a hanger or handles to anchor it to pretty much anything. very nice flower thank you sharing and the video. Becky....Oh my gosh!!! This video was amazing. You are one talented girl. I love stopping by your blog. I always know that there is so much incredible inspiration awaiting. Thanks again! How do we get template for this? Tammy, right above the video is the link. Love this... I am making a Alice in wonderland theme for my craft room... Now I have to make this to put above my teapot curtains. Thanks. for the flower pattern do you use 8x11 card stock or 12x12?